In a heavy large saucepan stir together the sugar and cocoa powder. Stir in eggs, egg yolks, evaporated milk, and stick cinnamon. Cook, stirring constantly, over medium heat until mixture thickens slightly and an instant read thermometer registers 165 degrees F; do not let boil. Remove from heat. Place the pan in a sink or bowl of ice water and stir for 2 minutes. Remove stick cinnamon; discard. Whisk in whipping cream, port wine, brandy and vanilla. Cover and chill for at least 4 hours or up to 24 hours before serving (mixture will thicken a little more upon chilling). 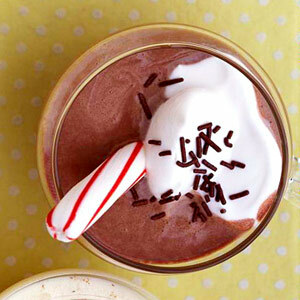 Garnish each serving with a dollop of whipped cream and top with chocolate shavings and/or chocolate sprinkles. Add peppermint sticks to each serving, if you like. Makes 8 (4-ounce) servings. Double Chocolate Eggnog Deluxe: Prepare as above, except substitute 1/4 cup dark creme de cacao, Godiva Liqueur or other chocolate-flavored liqueur for the 1/4 cup port wine or Madeira. Nonalcoholic Chocolate Eggnog Deluxe: Prepare as above, except omit the port wine and brandy and substitute 1/2 cup milk.